More than 150 participants including exhibitors, researchers and producers attended this symposium, which was organized from 8-10 October, 2013 in Curitiba, Brazil by EMBRAPA, and co-sponsored by various national and international organizations including IUFRO through its Research Group on Agroforestry. Thus, there was wide agreement among participants on the need to promote afforestation, agroforestry and other alternatives that will ensure the sustainability of natural resources in the face of climate change. Large variations between high and low temperatures, which lead to either frost or drought, and the lack of rainfall that has caused droughts in some regions of Latin America lately, are severely affecting agricultural areas. Problems with frost, for example, caused great losses to farmers only a couple of weeks ago in southern Brazil, northern Argentina and in the central zone of Chile. And the droughts that occurred in recent years in areas of Chile exacerbated the problem of water scarcity and affected crops and rural populations. Here afforestation and agroforestry can help farmers to adapt to climate change. Therefore, it is imperative to create incentives for afforestation and the introduction of trees in the fields through agroforestry systems, and for the implementation of extension mechanisms and technical assistance to the population. What effects does climate change have on trees, crops and animals? What are the challenges and opportunities of afforestation in grasslands? Which species are suited for use in silvopastoral systems in areas of frost? How can extension and technical assistance reach out to landowners interested in planting trees on pastures? 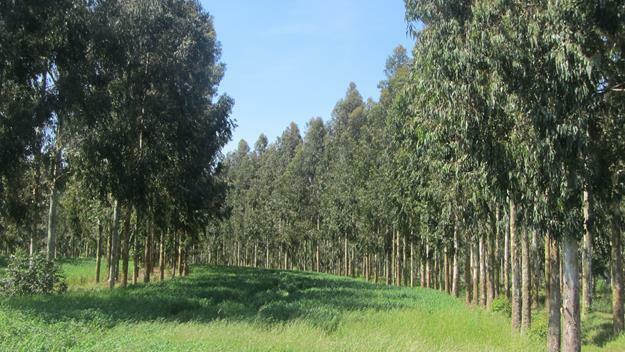 In the course of the symposium, participants could visit various sites to learn from the experience gained with silvopastoral systems using different species of Eucalyptus sp., in combination with crops such as oats, and various forage species. In addition, EMBRAPA researchers talked about their research on the effect of silvopastoral systems in carbon sequestration, and reducing erosion. Published and edited by IUFRO (International Union of Forest Research Organizations).